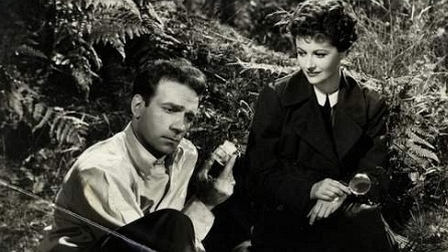 Margaret Lockwood and Dane Clark in Highly Dangerous. With bugs in a jar. Highly Dangerous (1950). In this British thriller, the lovely Margaret Lockwood plays an entomologist sent by the government to Balkan country to identify an insect being developed for biological warfare. An American newspaperman helps her out when the British agent she’s supposed to contact is shot. When the newspaperman admits he’s not digested by bugs, Lockwood’s character knows she’s found her man. :) And, as if a good story wasn’t enough, fans of Lockwood’s The Lady Vanishes and Night Train to Munich will be happy to see Naunton Wayne in this film, though he doesn’t mention cricket even once. Three Guys Named Mike (1951) Stewardess Jane Wyman is the object of the romantic attention of–you guessed it–three guys named Mike: one pilot (Howard Keel), one businessman (Barry Sullivan), and one chemistry graduate student (Van Johnson). Van Johnson take her to the research lab and gives her a great explanation for bioluminescence. Cry Wolf (1947) Intrepid geology PhD student Barbara Stanwych goes to the family home of her late husband (a marriage of convenience–he had to be married to inherit and she needed money to continue her studies. He was to pay her and they go separate ways) after he mysteriously dies. 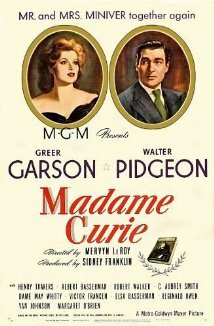 Jaz added the biographies Madame Curie, a 1943 film with Greer Garson and Walter Pidgeon, and The Story of Louis Pasteur (1936). Jaz: I saw Madame Curie a long time ago, so my memory of it is a bit fuzzy, but I do remember enjoying it. Also worth a watch: The Story of Alexander Graham Bell (1939), starring Don Ameche, Loretta Young and a very young Henry Fonda. I haven’t seen The Story of Louis Pasteur. Yes, yes, I slap myself on the wrist. How can a microbiologist and classic film junkie not have watched this? Well, I’ll tell you: there are about a bajillion films out there! Give me a break, people! Besides these, the only films that came to mind were Dr. Dolittle, Bringing Up Baby and The Absent-Minded Professor. All of which reinforce negative stereotypes of scientists. I mean, the latter film’s hero is named Professor Brainerd. Subtle, right? And they’re all super goofy and fly around on old cars and giant creepy moths. So we’ll ignore those for this post. I also recommend any book by the brilliant Jules Verne, who obviously did his research for every work. There’s a 1916 silent film adaptation of 20,000 Leagues Under the Sea, I found out recently — actually just now — .and which looks fascinating.